Home Fashion Would you Wear These Tiger Print Flares? Would you Wear These Tiger Print Pants? I will be honest. When I saw these tiger print pants on my asos app (I check the new arrivals every morning – whoops) I was honestly not too sure about them. But with free shipping and free returns what did I have to lose? Once I tried them on I was pretty much sold. Plus, they are so comfy! What do you think? Would you be willing to give these trendy pants a try? 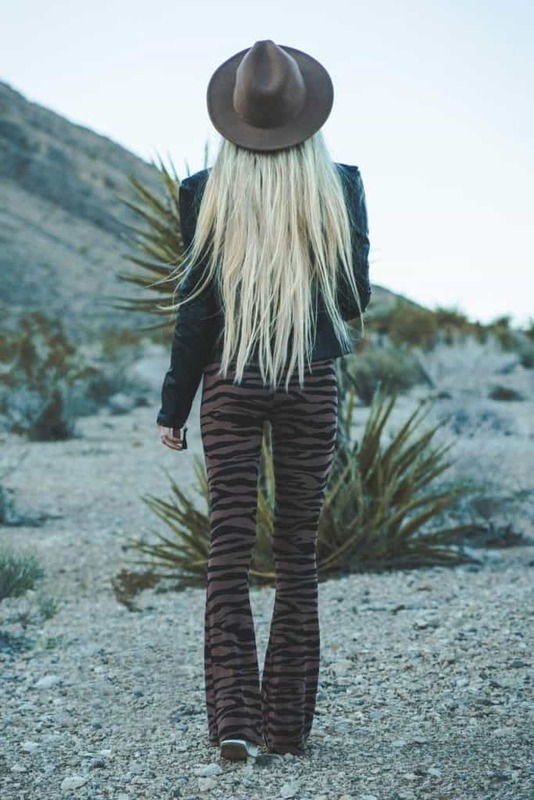 Pants – Tiger print flares that feel like pajamas. (Yes, please! Don’t think you can pull these off? Here are all the latest and greatest tiger print pants from ASOS. Hat – I bought this Fedora on Amazon(extremely affordable btw) and I will be honest, I am having a hard time coming up with outfits that look better without this hat. I have it in 2 colors the brown featured in this post and the gray. But the black and dark gray are calling my name…and it is taking all the strength not to buy them. You can see it here, and here if you are still on the fence. It really does work with just about everything. Boots – Old from Express (linked similar white boots). Basically the same pair here. Leather Jacket – You know you found the perfect leather jacket when you bought it 2 years ago and it is still in style and still sold at Nordstrom. Bracelets – Bought these at Nordstrom and they are my newest obsession. I have one that says “Take the Risk” (buy here) and another that says “Seek everyday magic”. You can the second here. The reason I love these so much is because they are so dainty (but not too dainty) and the writing is so small that no one else can read them. I am typically not someone who wears things people can read so clearly because I find annoying when you go somewhere and people are reading your shirt. Am I the only one here?! Haha. Hope you guys enjoyed this post! If you did don’t forget to share it with your friends and catch up on the latest fashion posts here.